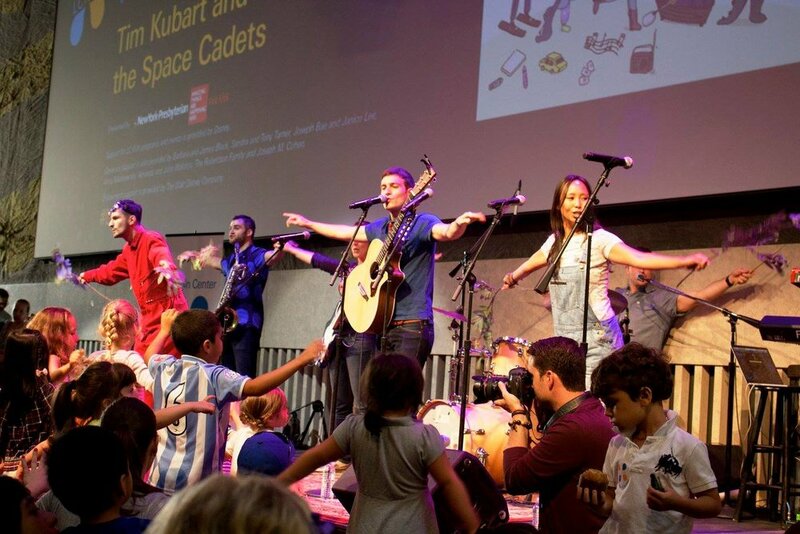 Tim Kubart's Kids and Family Music shows and albums are an indie pop experience for all ages.Tim tours the show nationally with his band (the Space Cadets) and plays songs about familiar and iconic childhood experiences with indie flair. Tim Kubart's Kids and Family Music shows and albums are an indie pop experience for all ages. Tim tours the show nationally with his band, the "Space Cadets," and plays songs about familiar and iconic childhood experiences with indie flair. Songwriters Tim Kubart and Matt Puckett weave their own childhood memories through textured pop tunes that bridge the gap between innocence and wisdom in a way for listeners of all ages to appreciate and understand. The show can always be adapted for your purpose and venue. From park bandshells to renowned theaters and museums to a stage at Lollapalooza and more, Tim's performance is an engaging, interactive set of original songs and stories. It's a dance party from beginning to end. The band is available in multiple configurations, from Tim and his tap-dancing sidekick to a full six-piece band. There's even room for optional brass, orchestra, and guest artists. If you're interested in finding a show near you, click here. If you're interested in purchasing an album, click here.